Pr e s by te r i a n s To d ay | OCTOBER/NOVEMBER 2017 23 we do ministry in our churches and the way we can transform communi- ties. People want to see how you live out the Word." Lomax said the transformative principles of Belhar — unity, recon- ciliation and justice — can have a profound impact on an individual's life as well as on the community. The church often portrays Jesus as a man of privilege. He's pictured as a white male. Sermons on his ministry may uphold white, middle-class values and many teachers and preachers ignore the radical economic and health ministries he performed for those in need. "Our church [First African Presbyterian Church] studied Belhar together this year for Lent," Lomax said. "We engaged issues of race. We reconnected and were reminded of the issues of racism that exist in this country. We found ourselves asking the question 'Where is the voice of the white church as we see more and more people of color killed and oppressed?' " Gail Strange is director of church and mid council communications for the Presbyterian Mission Agency. W. Mark Koenig is coordinator for racial and intercultural justice in the Mission Agency's Compassion, Peace & Justice ministry. 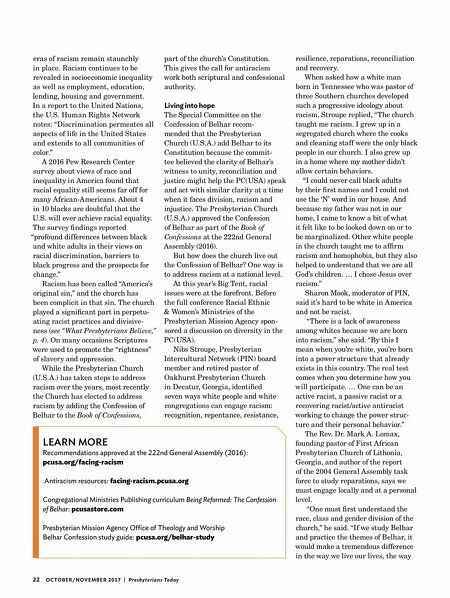 A n Oklahoma church has adopted a unique format in its effort to confront personal and societal racism. Trinity Presbyterian Church in Oklahoma City is hosting its second 10-week discussion on race and racism based on many of the principles of the Alcoholics Anonymous format. The Rev. Richard Mize, the white pastor of the mostly black congregation, modeled his meetings after the Rev. Ron Buford's Racists Anonymous meetings at Congregational Community Church (United Church of Christ) in Sunnyvale, California. Each meeting high- lights a personal account of racism or an encounter with racism, which leads to discussion on individual responses to racism. "I stumbled across what [Ron] Buford was doing, read it and said, 'That's us; we've got to do this,'" Mize said. "At the time, I didn't know he was a black man serving a mostly white congregation. I just read a story about a pastor in California doing this, and when I learned he was African-American, thought that's kind of an upside- down mirror image of my situation here." Mize describes himself as a "proud Southerner" who, although he came to Christianity as a young person in opposition to the culture of racism around him, didn't see anything wrong with the symbolism of the Confederate flag until sometime in his 40s. "It's hard to say that I was a mild racist," he said of his admission during the meetings. "They all laughed when I said that. … But it took a few encounters with black friends for me to walk away from it and to repent of it. Thank God that happened before 'Mother Emanuel' (Emanuel AME Church in Charleston, South Carolina, where Dylann Roof shot nine black parishioners dead). 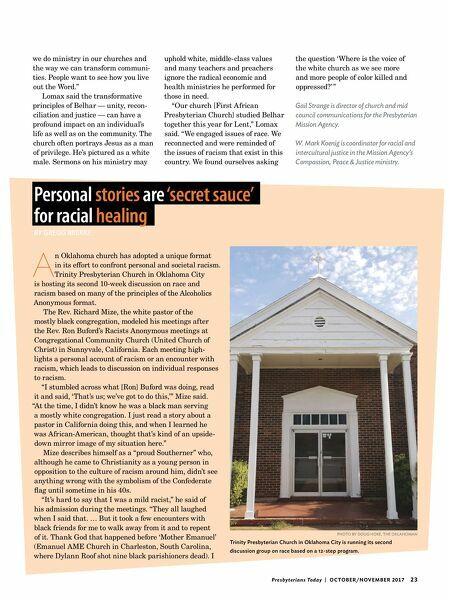 I Personal stories are 'secret sauce' for racial healing BY GREGG BREKKE PHOTO BY DOUG HOKE, THE OKLAHOMAN Trinity Presbyterian Church in Oklahoma City is running its second discussion group on race based on a 12-step program.